NEW ORLEANS — A tropical storm slamming into parts of Mexico isn’t taking aim at the massive gulf oil spill — for now — though any system can quickly change course and halt cleanup efforts. The logistics of containing the oil spewing into the Gulf of Mexico are mind-boggling even in ideal conditions. Things become even more complicated with the approach of a storm system like Alex, which has pelted Belize, northern Guatemala, and Mexico’s Yucatan Peninsula with heavy rain. Any system with winds over 46 miles per hour could force BP to suspend efforts to contain the flow for up to two weeks and delay the drilling of two relief wells that are the best hope of stanching the oil, Coast Guard Admiral Thad Allen said Saturday. He spoke shortly after Alex became the first tropical storm of the Atlantic hurricane season. Since then it weakened to a tropical depression, but last night regained storm status as it moved northwest across the warm waters of the Gulf of Mexico. Forecasters project a path that would take Alex to Mexico’s eastern coast around midweek. Its route last night was still well clear of the BP oil leak in the gulf, but officials were watching closely and said the storm could become a hurricane within 48 hours. “We all know the weather is unpredictable and we could have a sudden, last-minute change,’’ Allen said. Emergency plans call for moving workers and equipment five days before gale-force winds are forecast to arrive at the containment operation surrounding the blown-out well. Oil has been gushing since the drilling rig Deepwater Horizon exploded 50 miles off Louisiana’s coast April 20, killing 11 workers. Nearly 39,000 people and more than 6,000 boats are working there, in other parts of the gulf, and on land to skim and corral the oil, protect hundreds of miles of coastline, and clean fouled beaches. All of those efforts would have to be suspended if a storm threatens. Officials say oil has been spotted in at least two areas on the Mississippi coast, which had so far mostly been spared damage from the spill. Donald Langham, the Jackson County emergency management director, said tar balls and a patch of oil were spotted at the St. Andrews beach and at the Lake Mars pier in Gulf Park Estates. Langham said cleanup teams were on the scene and two skimming vessels are working. Louisiana, Alabama, and Florida have had oil wash up already. At the well, the two systems that have been capturing from 840,000 to 1.2 million gallons of oil a day would be unhooked in the event of a storm, leaving oil to gush freely into the gulf again. No one knows exactly how much is flowing, but worst-case estimates indicate it could be as much as 2.5 million gallons a day. Work would also stop on the two relief wells being drilled to take the pressure off the blown-out well, considered the only permanent solution. The first relief well is on target for completion by mid-August, but there could be a significant delay if people and ships come ashore to ride out a storm. Despite the setback a suspension would represent, “the safety of life is number one priority,’’ Allen said. “What boom they don’t pick up — and there’s miles and miles of it, so there’s no way they can pick it all up — will end up back in the marsh,’’ said Ivor van Heerden, former deputy director of Louisiana State University’s Hurricane Center. 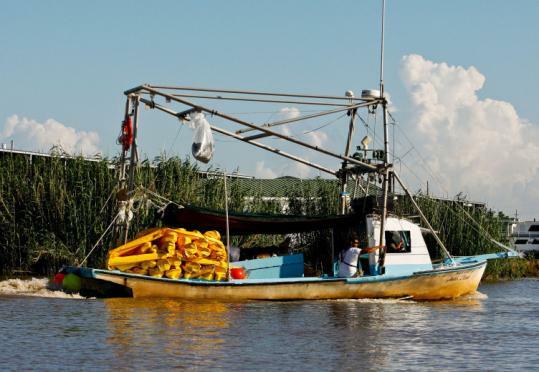 Once a storm’s expected direction is determined, barges and crews plan to remove as much boom in its path as possible, said Sam Phillips, solid waste permits administrator with the Louisiana Department of Environmental Quality. The boom would be stored on barges so it could be put back in place quickly. The spill — and the prospect of a hurricane whipping oily water into bayous and coastal communities — is also complicating the hurricane planning. BP, the Coast Guard, and the state of Louisiana have been talking about how to coordinate evacuations.